Root AI, of Somerville, has designed a harvesting robot with “fingers” that can pick things as delicate as tomatoes and strawberries. Most farmers can tell at a glance if their crop is ready to harvest. Josh Lessing has a robot that can do that, too. Lessing is cofounder of startup in Somerville called Root AI, which is developing technology to solve some of the most enduring challenges in agriculture — a sector that has long struggled with labor shortages, seasonal schedules, and compressed harvesting periods. 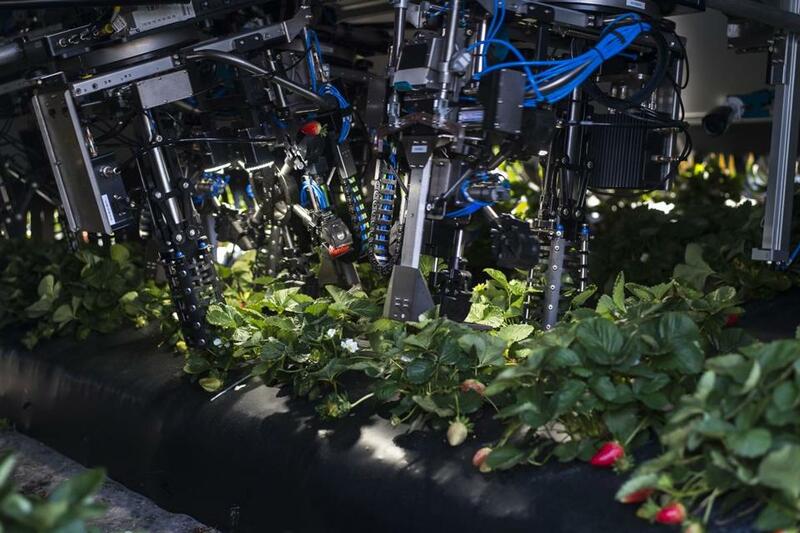 The company’s first robot, named Virgo, is designed to pick tomatoes. It has a camera and artificial intelligence software that analyzes whether the tomato is ripe, and an arm with delicate “fingers” that swings out and snags the fruit right off the vine. The machine has been tested at a greenhouse in California, and if everything goes according to plan at Root AI, you might be eating a Virgo-picked cherry tomato sometime next year. This is but one of the ways entrepreneurs are trying to bring a new generation of automation to farming. In Devens, Little Leaf Farms’ automated greenhouse produces salad greens that are hardly ever touched by human hands. Root AI technicians monitored the robot during testing in California. 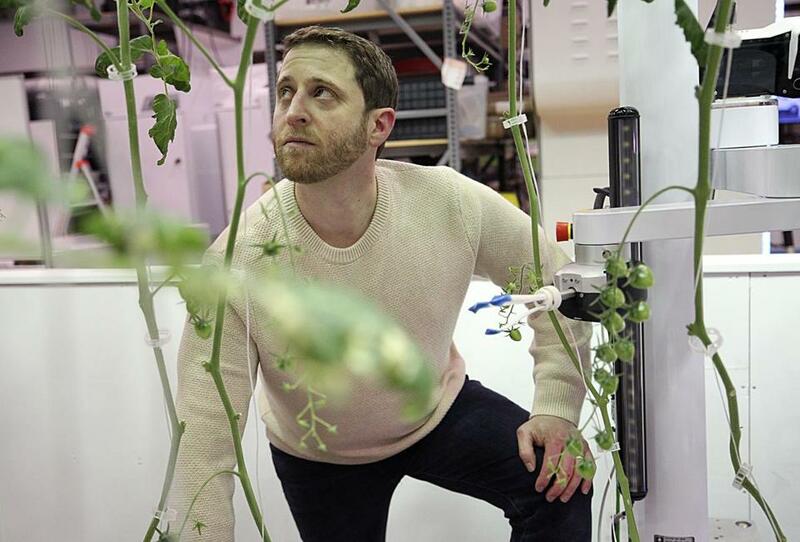 “You could say the whole greenhouse is a robot,” said Little Leaf cofounder Paul Sellew, whose company sells to supermarkets throughout Massachusetts. Its hydroponic process uses rainwater collected from the greenhouse roof and zapped with ultraviolet light to kill any bacteria. It takes about three weeks for the greens to reach maturity, and a machine automatically harvests and packages them. In California, Iron Ox has a similar automated growing operation for greens — not in a dirt field of the sprawling Central Valley, where so much of the nation’s produce is grown, but in a warehouse in a suburb of San Francisco. The company grows about two dozen varieties of greens that can be delivered to Bay Area diners within hours of harvest. “I think there’s a lot of opportunity in just delivering a better head of lettuce,” said Iron Ox’s chief executive, Brandon Alexander. And plenty more companies are joining the race, including Florida-based Harvest CROO, which is building automatic harvesters for strawberries. All are working to solve a perennial human challenge: What’s for dinner? Chris Buck, head of capital markets at the investment firm ROBO Global, said improvements in artificial intelligence and machine-vision systems are making robot farming a practical option. Florida-based Harvest CROO builds automatic harvesters for strawberries, like the one shown above. The world’s population is growing, while the industry that feeds it is under constant pressure. Agriculture is already highly automated in the United States, but farms still need people to pick many fruits and vegetables. The work is hot, arduous, and dull, and few people want any part of it. Farmworkers are “great folk,” Lessing said. “It’s just there’s not a lot of them.” And there are even fewer now, in part because of better options in a strong economy and the effect of the Trump administration’s border policies on the largely immigrant workforce. Another problem is geography. More than half the human race lives in cities, often many miles from where their food is produced. Food loses its freshness in transit. Some fruits, such as tomatoes, are bred to survive the long trip, but that can make them tough and nearly flavorless. And vast amounts of fossil fuels are burned just to get food from California farms to Boston tables. Many farm products could be grown in large greenhouses in or near population centers — hydroponically, using nutrient-enriched water instead of soil. Such facilities can be operated year-round, generating much higher crop yields than do traditional farms. And since the crop would travel just a few miles, farmers could grow produce with the best flavors, not the toughest skins, and they would arrive on the table freshly picked instead of travel-worn. Root AI cofounder Josh Lessing has a doctorate in physical chemistry from MIT, and his postdoctoral work at Harvard focused on developing safe, gentle artificial hands for robots. Lessing has a doctorate in physical chemistry from the Massachusetts Institute of Technology, and his postdoctoral work at Harvard University focused on developing safe, gentle artificial hands for robots. Later, Lessing joined Soft Robotics, a Bedford company that makes robotic grippers designed for sensitive work, There, he met robotics engineer Ryan Knopf, his cofounder at Root AI. Lessing and Knopf’s research in the food-processing industry convinced them of the need for better automated systems for harvesting delicate crops. Root AI’s first product, Virgo, is named for the Greek goddess of the wheat harvest. “There’s no goddess of tomato harvests,” Lessing said. Virgo is built to pluck cherry and grape tomatoes, though the system can handle larger fruit. 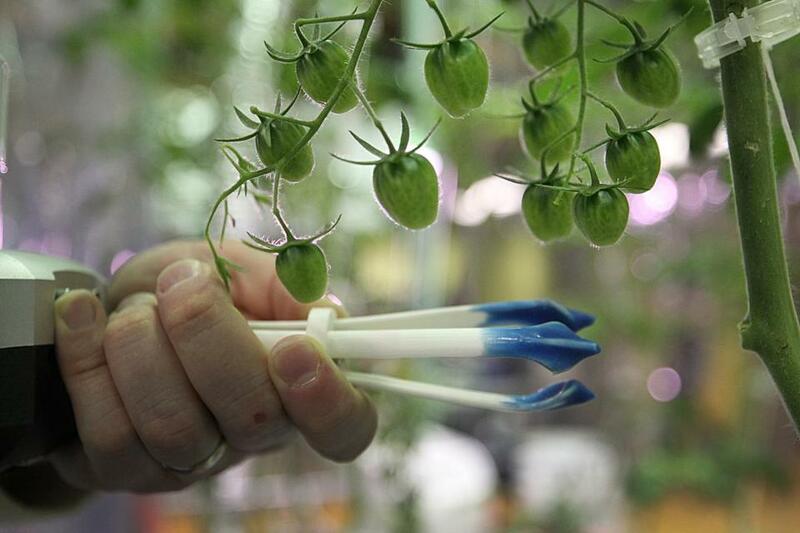 Its three-fingered flexible gripper squeezes just hard enough to pull a tomato from the vine. 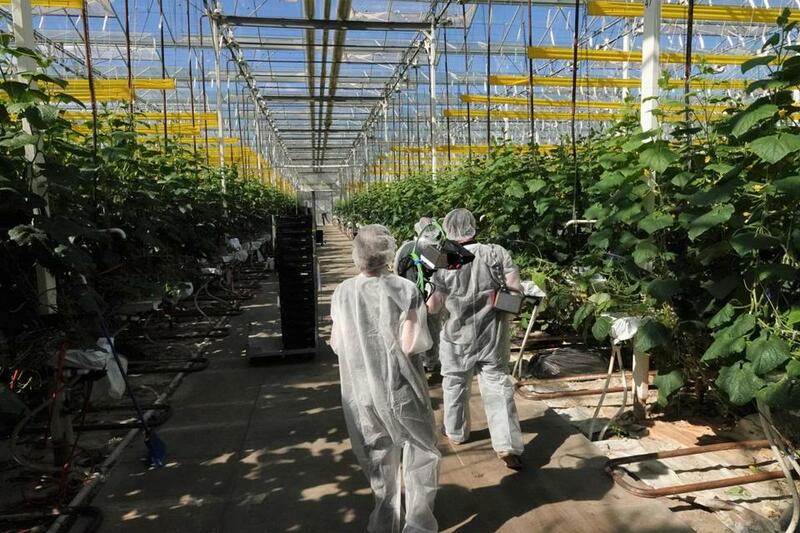 The camera that steers the gripper has a video-processing chip and artificial intelligence software that’s been trained by being fed millions of images of ripe and unripe tomatoes. For now, the Virgo AI system focuses on the harvest end of the cycle, but Lessing expects it to someday assess the health of the plants or detect the presence of insect pests. Root AI recently tested Virgo at a California greenhouse. The company declined to identify the grower, but Lessing said Virgo “is identifying ripe tomatoes as well as a person” and picking them without doing any damage. The robot had to be pushed manually down the rows of plants, but Lessing said it will be easy to add a drive train to carry the robot in a straight line.